In collaboration with top hospitals and Harvard, we conduct several clinical trials exploring objective methods for assessing depression and its severity. Current methods to assess depression and then ultimately select appropriate treatment have many limitations. They are usually based on having a clinician rate scales, which were developed in the 1960s. Their main drawbacks are lack of objectivity, being symptom-based and not preventative, and requiring accurate communication. 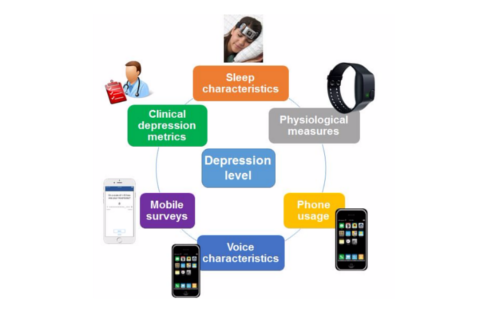 This work explores new technology to assess depression, including its increase or decrease, in an automatic, more objective, pre-symptomatic, and cost-effective way using wearable sensors and smart phones for 24/7 monitoring of different personal parameters such as physiological data, voice characteristics, sleep, and social interaction. We aim to enable early diagnosis of depression, prevention of depression, assessment of depression for people who cannot communicate, better assignment of a treatment, early detection of treatment remission and response, and anticipation of post-treatment relapse or recovery. 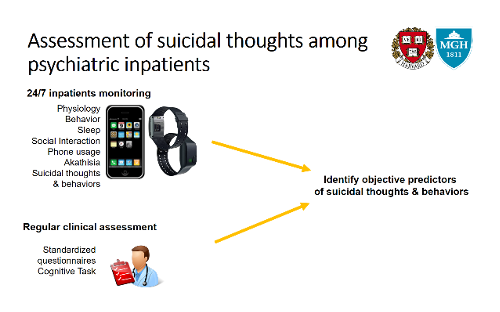 This collaboration between MIT, Harvard and Massachusetts General Hospital examines: (1) the natural occurrence of suicidal thoughts using smart-phone based self-report assessments; (2) novel behavioral predictors of suicidal thoughts; (3) affective predictors of suicidal thoughts; (4) the physiological and behavioral predictors of suicidal thoughts. What suicidal thoughts look like in nature (i.e., How long do they last? How frequent, intense, and persistent are they among those who have them)? What cognitive, affective/physiological, behavioral, and social factors trigger their occurrence? The reason for this lack of information is that historically researchers have used retrospective selfreport to measure suicidal thoughts and have lacked the tools to measure them as they naturally occur outside the lab. the physiological and behavioral predictors of suicidal thoughts. Python framework for ubiquitous sensor networks enabling a higher interoperability and ease of reprogramming. 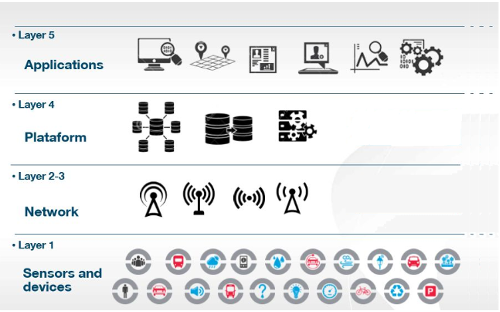 In recent years Wireless Sensor Networks (WSNs) have been deployed in wide range of applications from the health and environment monitoring to building and industrial control. However, the pace of prevalence of WSN is slower than anticipated by the research community due to several reasons including required embedded systems expertise for developing and deploying WSNs; use of proprietary protocols; and limits in scalability and reliability. In this project we developed PyFUNS (Python-based Framework for Ubiquitous Networked Sensors) to address these challenges. PyFUNS handles low level and networking functionalities, using the services provided by Contiki, and leaves to the user only the task of application development in the form of Python scripts. This approach reduces required expertise in embedded systems to develop WSN based applications. PyFUNS also uses 6LoWPAN and CoAP standard protocols to enable interoperability and ease of integration with other systems, pursuing the Internet of Things vision. Through a real implementation of PyFUNS in two constrained platforms we proved its feasibility in mote devices, as well as its performance in terms of control delay, energy consumption and network traffic in several network topologies. As it is possible with PyFUNS to easily compare performance of different deployments of distributed application, PyFUNS can be used to identify optimal design of distributed application. A new solution for visually programming WSN applications and for discovering the smart home devices and available distributed services provided by wireless sensors and actuators. Most of the currently deployed integrated home management products require an experienced technician to install and configure the system. In this project, we build upon the Internet of Things (IoT) paradigm, with the aim of delivering networked solutions that enable multi-node wireless sensor networks (WSNs) to connect to the Internet in a secure, simple and efficient way. We also describe the design and implementation of a smart-home management system. The system is composed of a lightweight tool with an intuitive user interface for commissioning of IP-enabled WSNs. 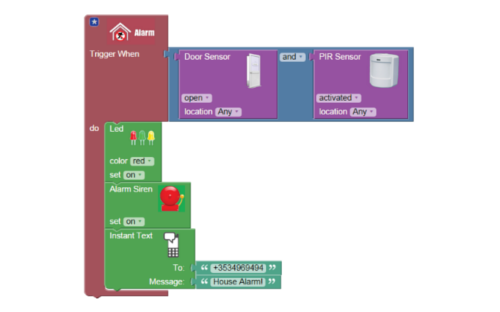 The solution includes a visual programming interface with a common framework for discovering smart home services on the WSN, and a code analysis and translation engine to generate Python code. This engine analyses the application rules defined with the graphical user interface and translates them into distributed application scripts. The system also includes modules to plan the optimization of the deployment, and deploy and start the generated code. The solution has been implemented and demonstrated on a platform with several smart home applications. Recently, wearable devices have allowed for long term, ambulatory measurement of electrodermal activity (EDA). 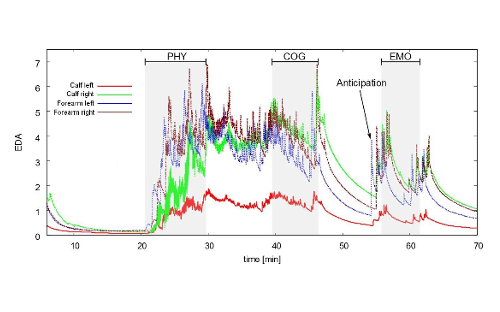 Despite the fact that ambulatory recording can be noisy, and recording artifacts can easily be mistaken for a physiological response during analysis, to date there is no automatic method for detecting artifacts. 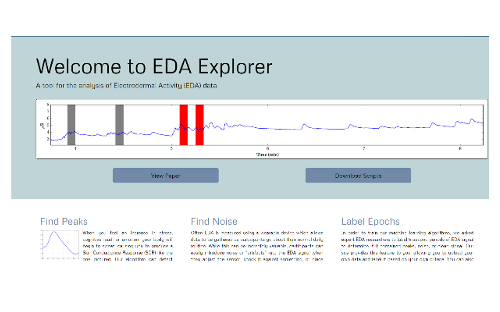 In this project we developed a machine learning algorithm for automatically detecting EDA artifacts. We have encoded our results into a freely available web-based tool for artifact and peak detection. Cooja is a very popular sensor network simulator for Contiki operating system, but it lacks support for modelling sensing coverage, focusing instead on network connectivity and protocol performance. However, in practice it is the ability of a sensor network to provide a satisfactory level of coverage that defines its ultimate utility for end-users. 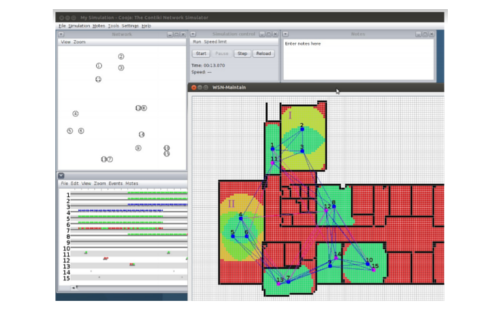 In this project we developed a Cooja-based tool for coverage and network lifetime evaluation in an in-building sensor network. To extend the network lifetime but still maintain the required quality of coverage, the tool finds coverage redundant nodes, puts them to sleep, and automatically turns them on when active nodes fail and coverage quality decreases. Crosslateral, bilateral and lateral correlation of electrodermal activity measured on calves and forearms during different stressor tasks. In this project we examine electrodermal activity measured simultaneously from the left and right forearm and left and right calf locations on the bodies of healthy adult volunteers (n=32), sites that support long-term wear. The growing need for ambulatory measurement of sympathetic nervous system arousal makes it important to find an unobtrusive alternative to the palmar site for long-term measurement of electrodermal activity (EDA), where sensors may need to be worn for a month or longer. While prior studies have shown EDA measured on the palmar and forearm sites to be highly correlated, in this work we examine EDA measured simultaneously from the left and right forearm and left and right calf locations on the bodies of healthy adult volunteers (n=32) while each participant experiences three types of stressors: physical, cognitive, and emotional, preceded and followed by four rest periods. 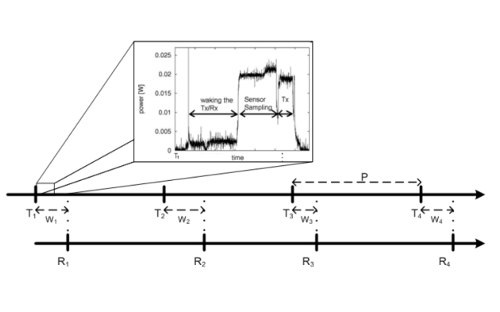 Separately, we also examine the lag of EDA response times in the physical task (stair-climbing). An European project with 9 partners and a goal of ensuring the cybersecurity and resilience of smart grids. 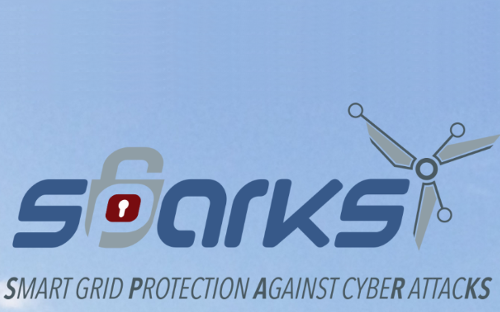 The first aim that SPARKS targeted is to promote awareness of smart grid cyber-security risks to stakeholders, including energy network operators and policy makers. SPARKS developed procedural and technical countermeasures, and provided cost assessments of the developed technologies. A goal is to make recommendations to standardization bodies. and novel hardware security technologies for smart metering applications. 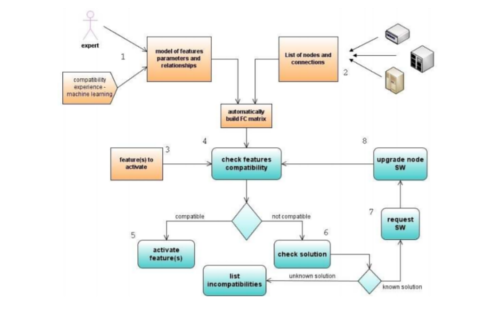 An European project which delivered a novel architecture, services, and engineering methodologies for robust, adaptive, self-organising, and cooperating monitoring and control systems to address the current problems of heterogeneity and interoperability, installation and commissioning complexity, and adaptability and robustness in the building monitoring and control space. 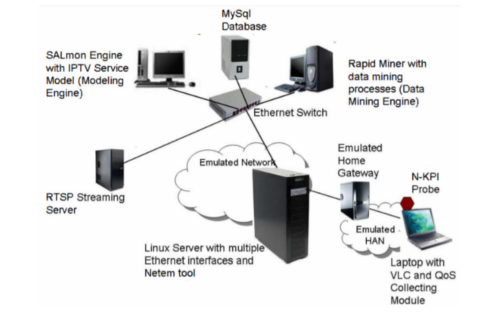 Large scale embedded Monitoring and Control (M&C) systems in energy management, transportation, security and safety often co-exist alongside each other with little cooperation within and among heterogeneous systems which hampers the increasing demand to operate the whole system optimally. A good example is building management, a market worth in excess of $36 billion annually by 2015, where a wide range of vendor specific, heterogeneous M&C systems for HVAC, access control, fire and safety, etc. are in use. This “stove pipe” system approach limits optimal solutions to energy-efficiency, occupant comfort, or fire safety, especially as most systems need to evolve over time and have to deal with unexpected or unpredictable dynamics such as fire. SCUBA will create a novel architecture, services, and engineering methodologies for robust, adaptive, self-organising, and cooperating monitoring and control systems to address the current problems of heterogeneity and interoperability, installation and commissioning complexity, and adaptability and robustness in the building monitoring and control space. SCUBA will develop semantic models for devices, systems and building management applications and will contribute to their standardisation to improve interoperability. SCUBA will provide a proof of concept of this approach by demonstrating how self-organisation will lead to simpler engineering, commissioning, and maintenance and how cooperation among heterogeneous, multi-vendor building monitoring and control systems will make the system more adaptive and robust in real building management applications. SCUBA addresses the challenges of the call including development of systems capable of dealing with complex, distributed and/or uncertain dynamics, development of self-organising, monitoring and control systems, providing methods for adjusting to/ recovering from failures, and standardisation of configuration interfaces and exchange platforms. 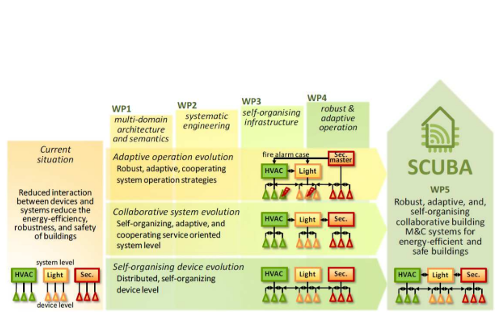 I was responsible for design, implementation and testing of the WSN service platform which enabled the horizontal integration of services provided by heterogeneous Sensor Networks. This test bed is based on IMS standard and I developed it in Java. To demonstrate the platform to the product development and business teams I implemented several applications (in the area of smart office and office booking management) using WSN services. The user applications were developed in Java with Swing GUI and I implemented sensor services on Sun SPOTs programmed in embedded Java. My PhD dissertation was focused on the cross-layer optimization of routing protocols in WSN. 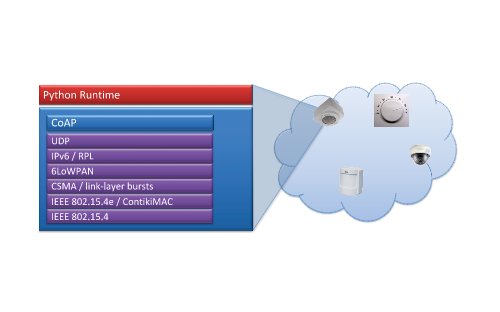 A common time reference across nodes is required in most Wireless Sensor Networks (WSNs) applications. It is needed, for example, to time-stamp sensor samples and for long-term duty cycling of nodes. Also many routing protocols require that nodes communicate according to some predefined schedule for reasons of energy efficiency. However, independent distribution of the time information, without considering the routing algorithm schedule or network topology, may lead to a failure of the synchronisation protocol. This was confirmed empirically, and was shown to result in loss of connectivity. This can be avoided by integrating the synchronization service into the network layer with a so-called cross-layer approach. This approach introduces interactions among the layers of a conventional layered network stack, so that the routing layer may share information with other layers. I explore whether energy efficiency can be enhanced through the use of cross-layer optimisations and present two novel cross-layer routing algorithms. The first protocol, designed for hierarchical, cluster-based networks and called Cross-Layer Efficient Architecture for Routing (CLEAR), uses the routing algorithm to distribute time information which can be used for efficient duty cycling of nodes. The second method – called Routing Integrated Synchronisation Service (RISS) – integrates time synchronisation into the network layer and is designed to work well in flat, non-hierarchical network topologies. I implemented and tested the performance of these solutions in simulations and also deployed these routing techniques on sensor nodes using TinyOS. I compared the average power consumption of the nodes and the precision of time synchronisation with the corresponding parameters of a number of existing algorithms. All proposed schemes extend the network lifetime and due to their lightweight architecture they are very efficient on WSN nodes with constrained resources. Hence, it is recommended that a cross-layer approach should be a feature of any routing algorithm for WSNs. A new method for quality monitoring of end-user services based on a service modeling and data mining to estimate the Quality of Service and Service Level Agreement status. Quality of Service (QoS) monitoring of end-user services is an integral and indispensable part of service management. However in large, heterogeneous and complex networks where there are many services, many types of end-user devices, and huge numbers of subscribers, it is not trivial to monitor QoS and estimate the status of Service Level Agreements (SLAs). Furthermore, the overwhelming majority of end-terminals do not provide precise information about QoS which aggravates the difficulty of keeping track of SLAs. In this project, we developed a solution that combines a number of techniques in a novel and unique way to overcome the complexity and difficulty of QoS monitoring. Our solution uses a model driven approach to service modeling, data mining techniques on small sample sets of terminal QoS reports (from “smarter” end-user devices), and network level key performance indicators (N-KPIs) from probes to address this problem. Service modeling techniques empowered with a modeling engine and a purpose-built language hide the complexity of SLA status monitoring. The data mining technique uses its own engine and learnt data models to estimate QoS values based on N-KPIs, and feeds the estimated values to the modeling engine to calculate SLAs. A new method of automatic feature compatibility assessment in mobile networks. This method enables easier and faster deployment of a new network or an upgrade of an already existing telecom network. Deployment and upgrade of a mobile network have always been challenging tasks. Very often they require human intervention because telecom networks are complex systems composed of different nodes that need to be compatible in order to communicate and provide network services. Therefore in current telecommunication systems a network expert must check all the requirements and compatibilities of the network prior to activation of a new service. Automation of the assessment of network compatibility is one of the key enablers for Autonomic Management of telecom networks. In this project we developed a new method for automatic end-to-end assessment of compatibility between network features in a telecom network. The method enables fast, easy and accurate decision making regarding the planning of new feature deployment or the upgrade of already existing features. We built a prototype that demonstrates the described method. It shows that our method is not bound to any type of telecom network and could be used to automate deployment or upgrade of a multiple-domain network.